The state of California became the sixth, and largest, state to license businesses to sell marijuana for recreational use on January 1, with some stores opening their doors on New Years Day. The business licenses are the latest step in the state's legalization of recreational marijuana, which began with the 2016 passage of Proposition 64. That ballot measure, which passed with 57 percent approval, allowed adults over the age of 21 to possess, transport, obtain, and gift no more than one ounce of marijuana. Residents are also allowed to cultivate up to six marijuana plants per residence, according to a summary from the pro-legalization National Organization for the Reform of Marijuana Laws (NORML). The recreational marijuana market in California is projected to reach a value of some $7 billion, with state and local governments able to eventually collect up to $1 billion a year in tax revenue. The state has already issued dozens of licenses, the Los Angeles Times reported, giving first preference to preexisting medical marijuana dispensaries. Under the newly implemented law, stores are required to register with the California state government, and pay substantial taxes: a 15 percent excise tax on purchase of cannabis, as well as a flat per-ounce tax on flowers and leaves that enter the market. Local governments will also be able to impose their own taxes. About 90 stores opened their doors on Monday, concentrated in San Diego, Santa Cruz, and the Bay Area; more are expected in the coming days. Some dispensaries are also delivering marijuana door-to-door, according to the LA Times, which interviewed one dispensary founder who had 31 drivers working in San Diego. Advocates of marijuana legalization cheered the new licensing regime as a step towards legal recreational consumption nationwide. 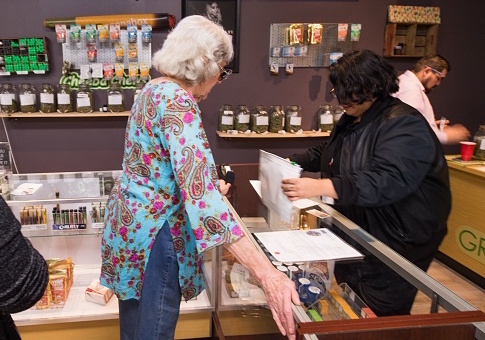 "The rollout of legalized retail marijuana sales for adults in California marks another watershed moment for the movement to reform our nation's marijuana laws," said NORML executive director Erik Altieri. "With the state being home to 12% of the nation's population and expected first year of sales totaling near $4 billion, California will only add more momentum to growing demand to end our failed prohibition on cannabis nationally and give even more Americans first hand experience with the sensible policy of legalization and regulation." But law enforcement and drug experts alike have expressed caution about recreational marijuana decriminalization more generally, to which Monday's rollout can only contribute. Jim McDonnell, the sheriff of Los Angeles county, believes legalization will be "eye-opening for a lot of people," according to the Associated Press. "The public's perception is that weed is innocuous, that this is something they did 40 years ago and it is no big deal," McDonnell said. "Well, today's marijuana is not yesterday's marijuana. The active ingredient, THC, is so much higher today than back 40 years ago." The city of Los Angeles has not yet begun issuing licenses for marijuana sales in its jurisdiction. Leaders in Siskiyou County have already declared a state of emergency and called on the state government to intervene to curb a proliferation of marijuana fields that have popped up in the county, where land is cheap, but outdoor cultivation is illegal. "We've got a monumental problem," County Sheriff Jon E. Lopey told a local CBS affiliate. Experts at the Hudson Institute have pointed to trends they qualify as "frightening" in nearby Colorado's own experiment with legal recreational marijuana, often seen as the test case for legal marijuana nationwide. They noted that 45 percent of Coloradans aged 18 to 25 self-reported using marijuana in 2016. Self-reported "past month" usage of marijuana by that same cohort rose by 31 percent against 2008-2009, when medical marijuana in the state was "greatly expanded." David Murray, a Senior Fellow at the Hudson Institute, wrote in August of 2016 that the upward trend in marijuana use, "unprecedented over such a short time, represents real behavioral change. Long-held and beneficial American norms against drug use appear to be collapsing." Recreational marijuana sales are not the first time California has been on the cutting edge of legalization: In 1996, the Golden State, by ballot initiative, became the first in the nation to make medical marijuana legal. This entry was posted in Issues and tagged California, Drugs, Marijuana. Bookmark the permalink.